Hi Everybody! I'm sorry that I've been MIA again when I still have so much to share with you. The last couple of weeks have been filled with Drama... Not bad drama! "Drama," as in the, "theater." My son is in high school and is part of the Drama program. For the last two week they have been performing Grease four times a week and we've been getting home really late (after 10pm on school nights-Yikes!)! So, between work, the school play and then my son getting sick there was nary a time to blog (I just said "nary." I'm killing myself). Hopefully, I'm back now (but this weekend is Mother's Day and my son turns fifteen on Mother's Day too so don't blame me if I disappear again over the weekend). I'm really excited to be sharing this card today. It's one of my favorites from my Display Board at OnStage. I've used two new sets here. The obvious one is So Many Shells (pg. 38 of new catalog: 143695). The not so obvious one... You're Priceless (pg. 160 of New Catalog: 143760). I absolutely love the both the shells and the sentiments in this set! To get this look I stamped the shell on Shimmery White in Island Indigo. Then I hit it with my aquapainter just to blend it a little. After that I spritzed it with a mixture of Island Indigo and water. A coating of Wink of Stella added the final touch. 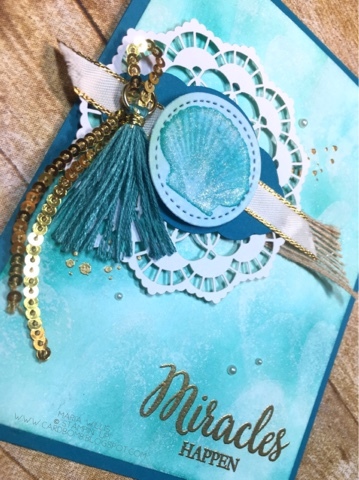 Check out the new mini sequins and the beautiful tassel in Tranquil Tide. This upcoming catalog really has some beautiful new accessories and these are two of my favorites. Did you notice the new Pretty Label Punch in the background? What about that new ribbon with the gold trim? It's all amazing I tell ya! The sentiments in the So Many Shells set are really lovely. I heat embossed this one in gold after finishing up the background. 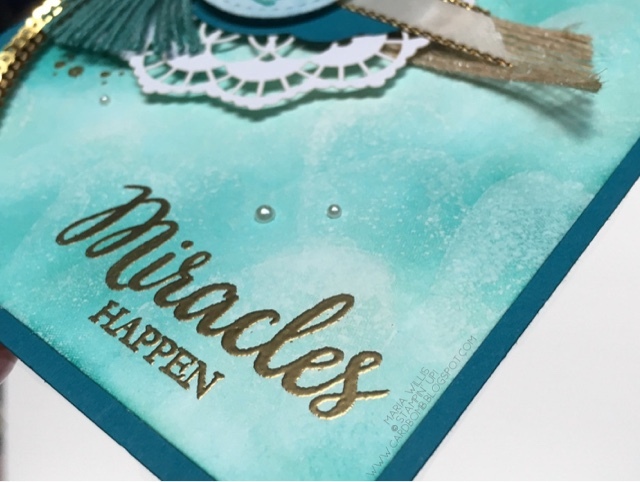 If you're wondering how in the world I used the You're Priceless diamond set on this card this is it-the background! I sponged the background in Pool Party and Bermuda Bay. 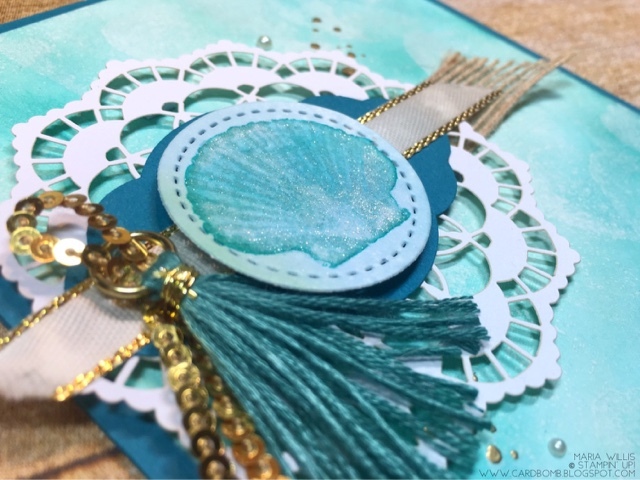 Then I used the splotchy stamp from You're Priceless with some White Craft Ink to create a background that I hope looks like ocean spray. Using the splotchy stamp made it incredibly easy! 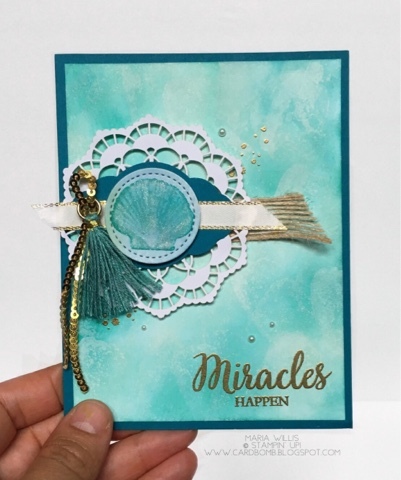 I added some gold embossing and some pearls to the background to finish my card off. I hope you liked my card today. Please let me know if you have any questions.